It just happened. We decided that this community deserves more and build better website. 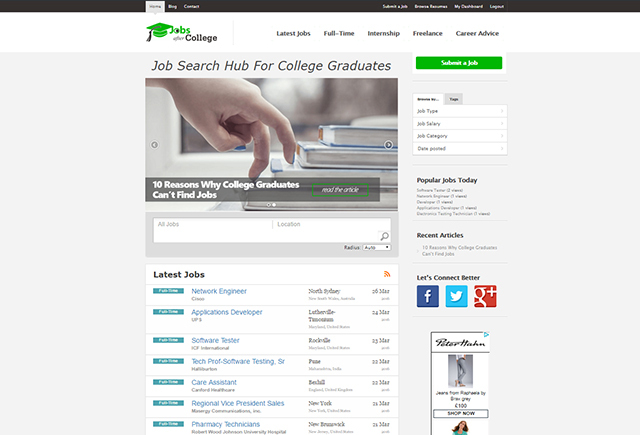 This website will no longer be updated as we are now going to use the new website, which is accesibe at the following address: www.jobsaftercollege.com. Jobs After College is more than a personal blog. It's a job board website for college graduates, students in their final year and young people in general who are looking for a job, probably their first one and we want to help this process by providing entry-level jobs internships from reputable companies all over the world. If you're a college graduate, you can create a profile and submit your resume. Your resume will be visible by employers who need a talent, and you may get a job invitation at any time. Jobs After College is also inviting employers and companies who look for a talent to create a profile and submit jobs because the kind of audience on the website is between 20 and 30 years - a young workforce from all over the work who is at the beginning of their professional career. But Jobs After College is more than a traditional job search site. Our plan is the build a career advice for college grads and help them around their career development through content and interaction. Visit Jobs After College and find out more!